How To Use Snapchat Replay, Visual Filters And Smart Filters Features? Snapchat has recently added a few new features to their highly popular ephemeral messaging app. The update brings new features like smart filters, visual filters, front facing flash, replay, special text and the ability to choose a maximum of 7 best friends. The update is perfectly timed just before the holiday season, the time when photo sharing apps are at their busiest best. Snapchat is a photo sharing app which has gained huge popularity in a very short time. Snapchat lets you share photos with your friends that self destruct after a preset time. Over 400 million photos are shared over Snapchat everyday making it the most popular photo sharing app. After you are done reading this, do check out other Snapchat features like Geofilters, Our Story and Chat. How To Use Replay Feature Of SnapChat? 1. In Snapchat’s home screen, press the gear icon on the top right hand corner. 2. Click on ‘Manage’ in ‘Additional Services’. 3. Turn on the ‘Replay’ option. How To Use Visual Filters In Snapchat? Snapchat has introduced 4 different filters for your photos. Follow step 1 and step 2 from above and then turn on the ‘Visual Filters’ option. To use visual filters swipe on the screen from right to left or vice versa after taking a photo. How To Use Smart Filters In Snapchat? With smart filters you can overlay the time, temperature or speed at which the photo was taken. Smart filters are activated similarly to visual filters. How To Use Special Text In Snapchat? Follow step 1 and step 2 from above and then turn on ‘Special Text’ option. With this special texts are enabled. With special text feature you can select normal font size or large font size. After taking the photo, press on ‘T’ in the top right to use this feature. 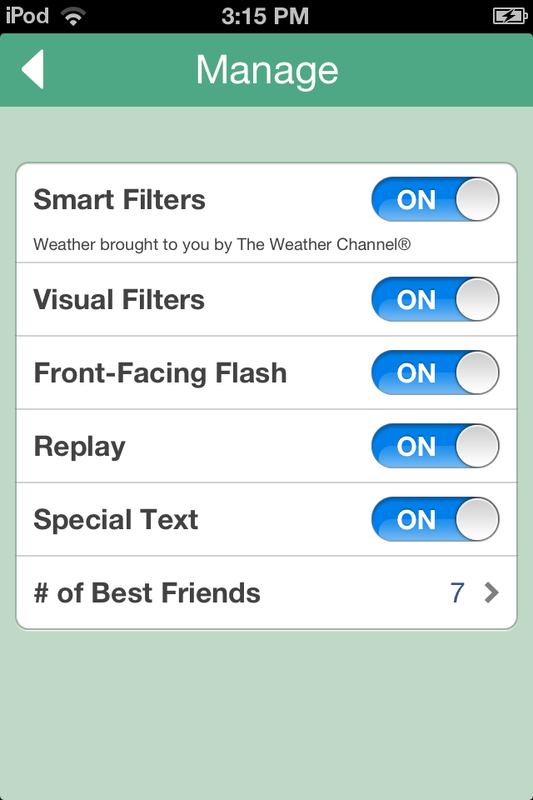 Front-facing flash and number of best friends features can be turned on similarly to the features above. Previously, Snapchat has introduced a feature called ‘Stories’ which lets you share snaps that can be viewed unlimited number of times in 24 hours. Snapchat Stories along with the new features seem to be shifting the messaging app away from the ephemerality that has made it so popular. Do you like these new features and what more features do you think Snapchat should add to its app? Do you know any snapchat usernames or passwords??? Why not create your own username and password? It’s a good service. i see only replay and front facing flash option under manage.Will i not be able to use the other features? please help. Update your app or maybe the latest version of the app is not compatible with your OS. I have an iPhone 5S, and its software is updated to the latest version. I do not have the Replay or Special Text option. Do I not have these features?